bananas | Counting my cookies... & Eating them too! I don’t know about you, but one of the things I love most about summer is the abundance of fresh berries! I love to bake with them and try new and interesting recipes. And I also have a passion for quick breads, in my house they’re called quick not because they are easy to make but because of how quickly they are gone! I picked up several boxes of strawberries this week because they were on sale, and I love them! So I started searching for ideas on what to do with them besides just stuff my face with fresh strawberries for a couple of days before they spoil. This is one of the things I came up with, from one of my favorite recipe blogs, Skinnytaste.com. I modified their recipe slightly by using gluten-free flour for half of the flour, I may try this again with all gluten-free flour as well to see how it turns out. The recipe as shown here turned out delicious! I really liked the idea of roasting the strawberries first, so most of the juice bakes out of them and doesn’t make the bread too moist. Preheat oven to 350 degrees F. Lightly spray loaf pan with baking spray. You can use one standard sized loaf pans, or two min-loaf pans. Place the cut up strawberries on a baking sheet (lined with foil, or paper), roast them for 20 minutes, remove and set aside. Meanwhile, in a medium bowl, combine the flour, baking soda and salt with a wire whisk. In a large bowl, cream the butter and sugar with an electric mixer. Add the egg whites, mashed bananas, apple sauce and vanilla, and beat at medium speed until thick. Add the flour mixture to the wet ingredients and blend at low speed until combined, do not over mix. Fold in the strawberries and pour the batter into the prepared loaf pan(s). Bake on the center rack in the oven for 45-50 minutes or until a toothpick inserted in the center comes out clean. Let the pan cool at least 30 minutes before removing the loaves. Bread should be at room temperature before slicing. Wrap in plastic or foil and store in refrigerator for 5-7 days (it will probably be eaten up before then anyway!) Or wrap well and place in a freezer safe bag and store in the freezer for up to 2-3 months. Oatmeal, in my opinion, is one of life’s perfect foods! Delicious, filling, nutritious and low-calorie. It’s easy to make, and you can do a million things with it. Oatmeal is also one of my favorite comfort foods. When I was a little girl, my mom used to cook oatmeal for me. She made the real “old-fashioned oats” that you cook in a pan (come to think of it, they didn’t even have instant oatmeal at that time, since, microwave ovens hadn’t been invented yet….yes yes, I know, really showing my age here!) Mom would plop the cooked oatmeal in a bowl, sprinkle some brown sugar on it and pour milk in it until when you stirred it, you ended up with something more like oatmeal soup. This thin, milky consistency is what I’ve grown accustomed to and it is soothing not only to my tummy but also to my soul. My husband, on the other hand, has never been a fan of oatmeal. Or fruit. 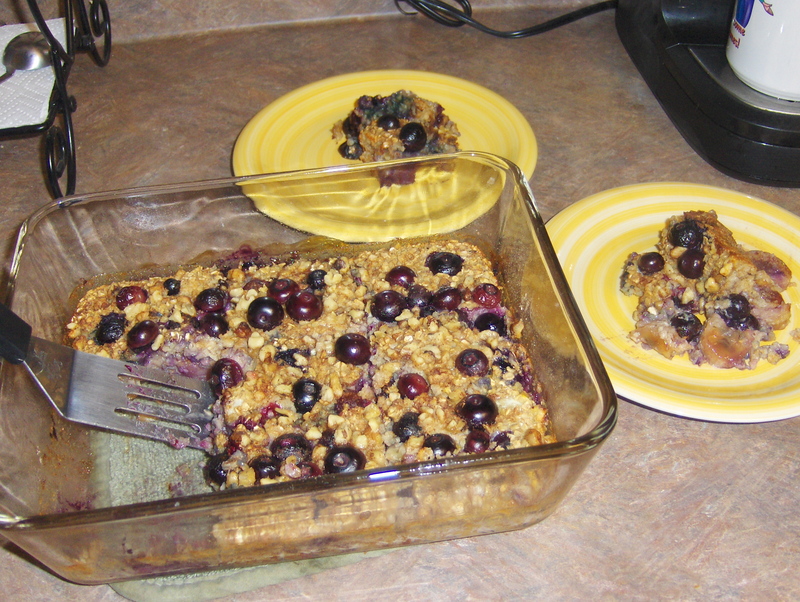 So, when I came across this recipe for baked oatmeal with blueberries and bananas, I was concerned I would be the only person in my household who would eat it. This situation has, in the past, kept me from trying many baked or crock pot oatmeal recipes that I found intriguing as I hate to go to all the effort and have it be something that doesn’t feed my whole family. This particular recipe looked so good to me that I decided I really needed to try it, even if I would be the only one to eat it – it just looked THAT good! Delicious warm out of the oven, and just as tasty reheated later in the microwave! The verdict? My husband agreed to try it. He liked it. I made it again the next week and he had a second helping! 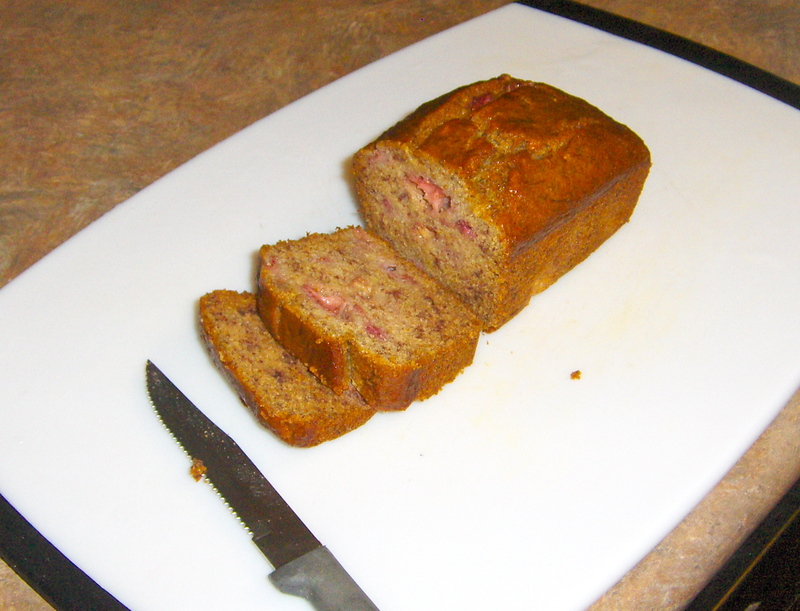 Then I tried other varieties of the recipe like strawberry-rhubarb, and just strawberry (both, also with bananas). I loved them all. Jim tolerated them, but began asking me to make the blueberry version again. This has now become a staple in our house, I make it almost every Sunday morning. We have it together for breakfast on Sunday, then I have enough left over that I can heat up a piece of it for breakfast all week before leaving for work. This dish is simple to prepare, has very few ingredients. 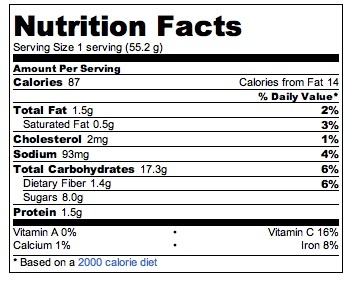 It does not use any added sugar, but instead uses honey as a sweetener. I personally like to use all organic ingredients – but I’m sure you can make this with any variety of the ingredients that you have on hand. This recipe is also very easy to adapt to any type of fruit or berries you may have at the moment. Preheat oven to 375 degrees F. Spray a 9″ x 9″ glass baking dish with non-stick spray. 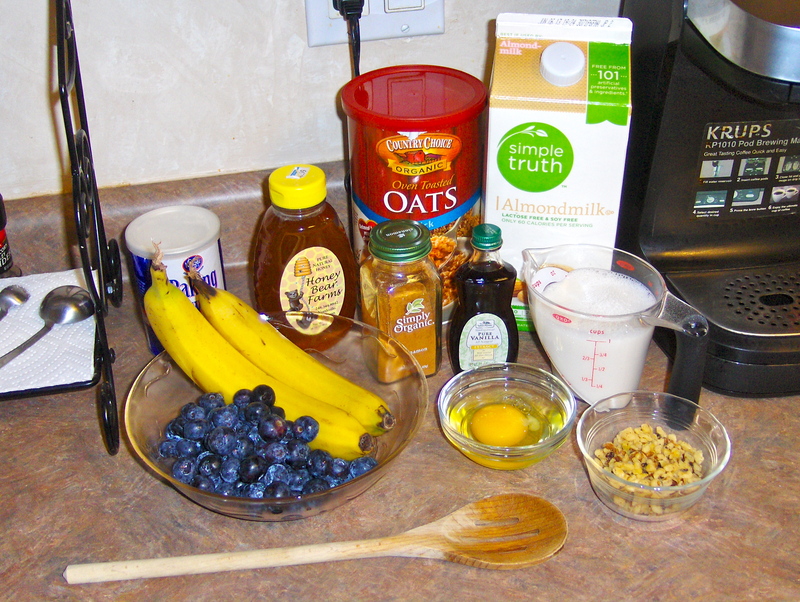 Spread the sliced bananas in the bottom of the prepared baking dish, top with half of the blueberries. Drizzle 1 Tbsp of the honey over the fruit, sprinkle with 1 tsp of the ground cinnamon. Cover with foil and bake for 15 minutes. 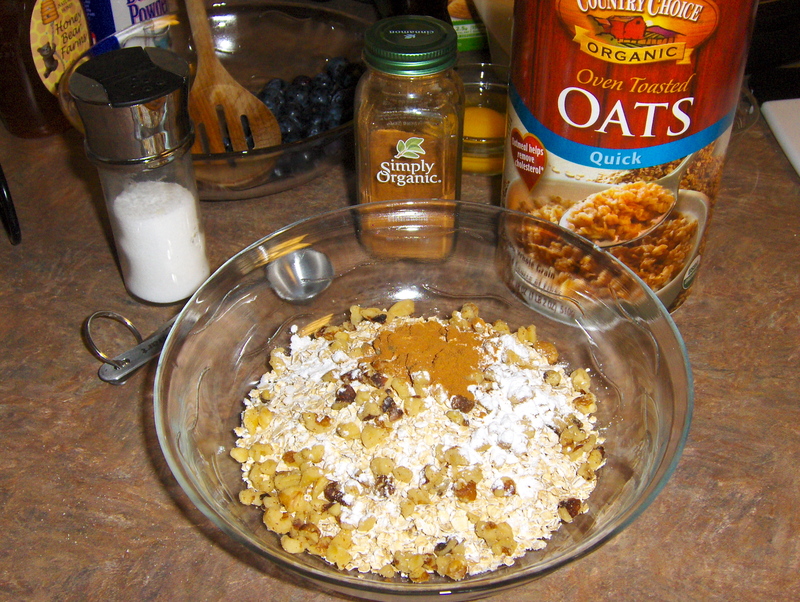 Meanwhile, in a medium bowl combine the oats, half of the walnuts, the baking powder, the remaining 1/2 tsp of ground cinnamon and the salt. Stir lightly to mix. 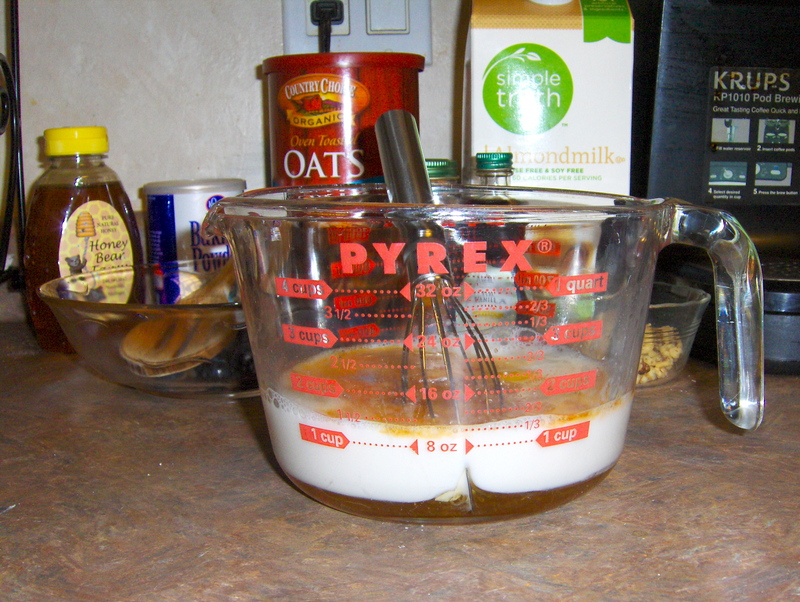 In a separate bowl whisk together the remaining honey, the milk, egg and vanilla. Remove the bananas and blueberries from the oven. Sprinkle the oat mixture over top, using your fingers to spread it out and even it out a bit. Then pour the milk mixture over top of the oats, distributing evenly so all of the oats are moistened. Sprinkle the remaining blueberries over this mixture then top with the rest of the walnuts. Bake uncovered for 30 minutes. After baking, allow to cool and set for just a minute or two, then cut into 6 servings, or 8 if you’d like to cut down the calories a bit more or if you have a bigger crowd to serve. Cover leftovers (if there are any!) and refrigerate for up to 5 days.